I have the sneaking suspicion that everyone around me is having much better breakfasts than I am. It's a meal I just can’t skip, but I always feel hesitant and risk-averse. Since I’m usually pressed for time, I’ve become a coward. It’s hard to talk about living in a different country without addressing breakfast. I’m originally from Cole Harbour, Canada, (Have you got a map? You’ll need a pretty good one.) Breakfast to me there meant toast and coffee while listening to Information Morning on CBC, before bundling up for the bus. Now, I live in Suzhou, China (Still got that map? It’s near Shanghai.) and my life is, in many ways, (all instigated by me of course, no sympathy necessary) turned upside-down, dig all the way to China, on its head. A fast, familiar breakfast is what I cling to. Suzhou is a city of several million people; you’ve probably never heard of it. Likely you’ve heard of other locales of four million or more: Toronto, or Los Angeles, or, say New Zealand. They’re bold dots on that map you’ve got, places maybe you’ve been to, places you’ve seen on TV. If I asked you, you’d probably say that people eat maple syrup and beavertails there, or Pinkberry and Gogi tacos, or legs of lamb and expensive pinot noir. The official population statistics for Suzhou are actually somewhere around six million; in fact, the city boundaries around us never quite fade to fields. East and Suzhou slips into Kunshan, then solidifies and hardens into the wall of brick, glass, steel, and dumpling steam that is Shanghai. North, and West, the streets of people give way to streets of factories, and turn slowly into Wuxi, and then on into the distance filled with names of places that I wouldn’t ask you to pronounce without a good primer to PinYin in your hands (along with that map). They’re doing a census here this year: big red banners are all over our buildings and courtyards asking us to comply with civility with the census takers. I’m sure they’ll count all the people; what I’d really love them to enumerate is all the different things you could have for breakfast. It would be possible to drive through Cole Harbour and remain entirely ignorant of what the population is eating. In Suzhou? Impossible. In Cole Harbour, you might catch a quick glimpse into a car alongside, the driver sipping a Tim Hortons coffee or balancing an egg sandwich, but your attention will be on driving. In Suzhou people seem more concerned with the eating than the driving on their commute. A drive down the street in Cole Harbour will show you shop after shop of chain restaurants with drive-thrus, but no signs of actual consumption. Still have that map? Maybe it’s a Google Map? Scroll in on Suzhou until you come to the centre of town, my centre axis, the street where I live, and running a straight line down from it, the street where I work. I live in the Master of the Flower Garden Building complex, a poetic name for what is no more than five or so buildings with the odd rosebush and ornamental pomegranate thrown in. It’s in an alley next to the Song Dynasty “Master of the Nets” Garden. The Garden is a Unesco World Heritage Site; my apartment complex is coasting on their reputation. The street is Shi Quan Jie -- Perfect in Every Way Street. I don’t know if it’s actually perfect in every way, but if you need a hot soup and meat filled baozi for breakfast on your way to work, hand-pulled noodles slipping through spicy peanut sauce, crisp fried sesame and spring onion pancakes, deep fried you tiao donuts. Fruits you’ve never seen before -- if this is what you call breakfast, Perfect Street is perfect for you. These days, I get none of it. I’ve eaten toast and drunk coffee hunched in pajamas at my computer, with iTunes playing CBC’s As It Happens; it’s my only tether to Cole Harbour for the rest of the day. My work day starts at 7:30 am, and the thought of making it out the house and then acquiring breakfast is a non-starter. I trade delicious for sleep and comfort. In China, I don’t take the bus. When I open my garden gate in the morning, I heave on to our family e-bike, piloted with nerve and grit by my husband. We whistle down the centre of Suzhou to Number One High School (est. 1035 -- also the Song Dynasty, in case you’re counting Dynasties. Maybe we should have a Chinese history book along with that map and PinYin primer?) We dodge more e-bikes. We careen around grannies in pajamas on push bikes, baskets full of qing cai and green onions. We skid past kids on scooters, texting on their iPhones, Coco bubble teas swinging in plastic bags from the handle bars while they stuff fresh-fried you tiao donuts into their mouths. We brake heroically as homicidal taxis -- battered Volkswagen Santanas, not driven so much as buffeted by drivers drinking tea made with leather-brown leaves in old beanpaste jars -- turn left suddenly in front of us. Black Audis driven by chain-smoking men in suits -- they don’t have time to eat, they are DOING BUSINESS? Those we give lots of space. We slip through holes and cut through clots of chaos, and ogle what everyone else is having for breakfast. <img src="http://forums.egullet.org/uploads/1286609993/gallery_29805_1195_31814.jpg" hspace="8" width="429" height="285" align="right">We fly by the Yang Yang Dumpling House, but the doors are shut. The metal safety door is at half-mast, and the day’s vegetable delivery is being carried in by young men in chef’s whites, their morning cigarettes dangling. No simple boxes here: so many vegetables go in, they’re carried in twenty gallon plastic tubs -- cabbages, cucumbers, Chinese leeks, grosses of white onions. In the kitchen are thirty twenty-somethings fresh off a bus from Shandong or Hubei (check your map); they’ll spend their whole day at the cutting board armed with their cleavers and red-pack cigarettes. But they don’t do breakfast. As we cross over Renmin Boulevard, I’m cheating now -- the street gets narrower in width and scope; and it’s no longer Perfect in Every Way Street. But my sense of direction is linear, and we haven’t turned left or right, so in my head, we’re still on Perfect Street. The Clots of Chaos are coming faster and stronger now, like meteors burning up -- the brake squeals are more furious, the brushes with other people’s breakfast closer. We’re next to the market. Every morning, I want to tap my husband on the shoulder and ask him to stop, but I can’t; we’re already late, and I’d never get through the throngs. 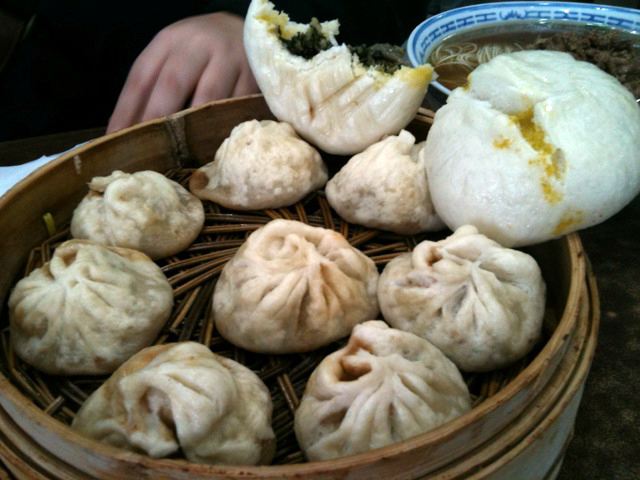 I want to stop and walk into the bamboo steamer towers and get a plastic bag full of baozi -- pork with rich broth; chicken with pine nut and ginger; chive and smoked tofu; sweet black sesame and peanut. I can see men in stretched white undershirts and neat trousers picking their way carefully through the mixed-density traffic, hefting bags of ten or more of these dumplings, on their way to breakfast tables of people who are lucky to have later starts to their day than I do. I have entertained the fantasy of reaching out and plucking a bag from their hands as we whiz by: Grand Theft Dumpling. But I know the traffic would never allow a clean getaway. They have earned their dumplings and anyway, I have eaten my toast. Traffic will play out such that at this point in the commute we’ll be forced either left or right, dodging the cars slowly emerging from the sanctity of their apartment complex parking. Lanes are but a suggestion, and the yellow line down the centre has been painted not to divide us into groups of people going This Way or That Way. The yellow line is in fact there for the cars to follow down the centre of the road. The sides are taken up by bicycles and people going in both directions in semi-regular intervals. <img src="http://forums.egullet.org/uploads/1286609993/gallery_29805_1195_64006.jpg" hspace="8" width="285" height="426" align="left">As we make it through the last intersection and cross onto a street that even official signage admits is no more than an alley, we pass a street corner thronging with people. If we’re forced left, a wooden table is covered with rows of small white baozi lined up like breakfast soldiers waiting for their turn in the steamer. There’s a lady there in an apron, and she’s rolling out lumps of dough, filling them with scoops of pork filling from a red-and-white enamel pan. When each is filled, she twists the top and drops it onto the steamer tray. A long line of students, ID cards around their necks, is waiting for its breakfast. If they haven’t made the run to Coco, they’re here. At the front is a man tending a wok full of oil, set just off the street on the sidewalk, shielded from the rain by a rainbow beach umbrella. He’s dropping in ropes of white dough, and plucking out glistening donuts -- you tiao. No neon “hot” signs are needed; we can all see his are fresh. 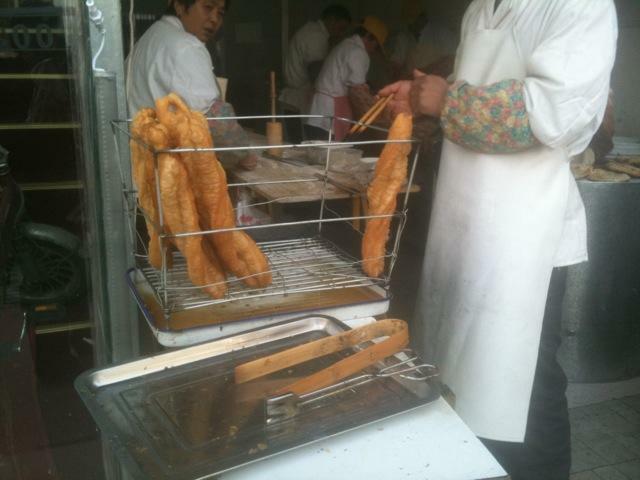 A hot you tiao would be just the thing with some milk tea, but they slip past us, just like the baozi. If we’re forced right, I peer in the open fronts of noodle shops. The cooking is done outside; more woks on the sidewalk. Giant pots of steaming water also mark the place as a noodle shop, if you find the old-fashioned calligraphy on his sign a challenge to read, as I do. The laoban has his mise en place set up on his table in small steel bowls; his cooking oil is in an enamel cup that commemorates either a shop opening or a party congress. I can read only the date. Red chili oil, brown peanut sauce, green chopped cilantro: a painter’s palette of garnish. 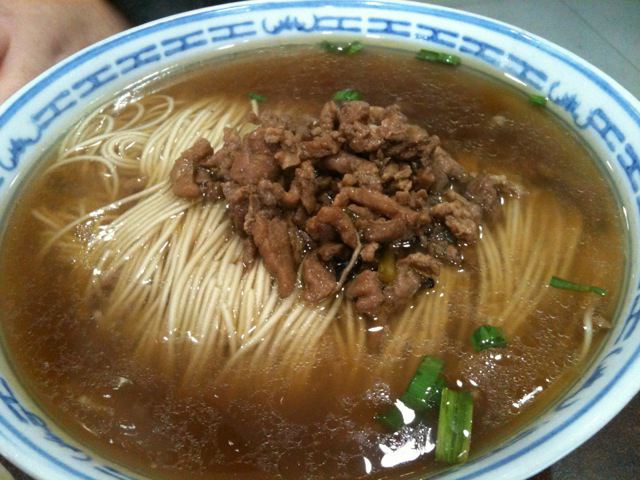 I have occasionally run over, in the perpetual Suzhou rain, for a bag of his noodles for lunch, and I know for a fact they are nothing short of a restorative tangle of carbohydrate. I can see the neighborhood bent over the tables set inside out of the rain. Only the tops and backs of heads are visible, as everyone tries in vain to keep splatters of chili oil off their shirts. I am simply not up to this challenge at breakfast. Arriving at our school, the neighbourhood duck comes out to honk a morning hello. My husband comes to a seat-sliding halt in front of the Cold Drink Fridge, run by a young family who sit around the fridge door. Since all the water coolers in our school maintain the temperature of the water at a qi-optimizing 25 degrees Celsius, this is our last chance for a Cold Drink to round out our breakfast. Purveyors of the Cold Drink Fridge care not for our qi (um -- Chinese-English dictionary? Any chance of…? No? Actually, I think it means energy. Or life force. Or something). They are happy to make a few kuai off of our blatantly unhealthy lifestyle; at lunch they also sell fried chicken sandwiches. Bottles in hand, I join my students walking through the gate, and say a “Ni Hao” to the Gate Guard as we walk by. They are stuffing their you tiao into their mouths and manically sucking on their Coco straws, hoping to get the jelly bubbles down before their homeroom teachers bark out orders to jettison cold drinks. I have enough time to get my own tea jar going before the day starts for me, and thoughts of breakfast evaporate like the dumpling steam. I hope your own breakfasts are not as filled with regrets as mine. Erin Garnhum (aka nakji) lives and teaches in Suzhou, China. She is an eGullet Society manager. Oh my Erin- I am exhausted just from reading; I can not imagine the actual journey. You put me right in the throng and I am overwhelmed with the possibilities. Should the sleep fairy wake you one day with loads of energy and extra time I hope you will indulge in the local breakfast choices and take us along for the ride. Canadian/British spelling in the Daily Gullet!?!?!? Never thought I'd see that happen! Hope to see more! Hey Rona -- as editor, I believe in allowing a letter-writer to write in his/her own voice and use the heritage spelling. (Trust me, it took five years before I stopped spelling "centre" for "center." What I really want is for Erin to wake up half and hour earlier and commit Grand Theft Dumpling. Erin, I can assure you that your delicious breakfast journey, (while fast and furious), is far more interesting than my own bland morning snack. Thank you for a fascinating glimpse into the pace of life in Suzhou. Thanks all. I do actually go to those stands, although usually for lunch. Grand Theft Dumpling is extremely tempting, but I couldn't deprive anyone of their hard-won breakfast. Just yesterday I discovered an incredible paratha bread stuffed with egg and spring onion stand. I asked at least three people what it was called, including the vendor, and everyone seemed bemused that I'd asked. The best answer came from one of my students: "It has many names. I can't give you just one." So she gave me none. Fabulous!!!!!!!!! The local life, being so different from what any tourist can experience is a real eye opener. Always enjoy your posts, and this is the BEST. More Please. What a fabulous ride you've taken us on, Erin! I could feel the early morning energy. All that hurrying and impatient waiting for breakfast made me wish for a quiet spot to watch it from (I always enjoy sitting lazily watching others rush around ). Really fascinating, Erin. I was actually in Cole Harbour last week end I have to say, their loss is Suzhou's gain. I'd like to point out that in addition to Nakji, it's the birthplace of Sidney Crosby and The Trailer Park Boys. Erin, what are you tiao donuts? Your letter reminds me of my walk to the light rail station (on my way to work) when I lived in San Francisco. I walked by this great little bakery that made excellent croissants and pastries. In my case it wasn't so much time as it was calories, but when I had time, I'd just stand in front of the shop and smell the great aromas. Not as satisfying as eating the goodies, but it always made me happy. They're a sort of deep-fried cruller. I'm not quite sure what goes into the dough, but they're yeasted. I'll take a photo of some on my way to work next week and add it here. The trip to work is one of my favourite parts of each day, and I can reconstruct it in my memory for each place I've lived in. Definitely Suzhou is the one that has offered the best breakfast options, although that's just a measure of the neighborhood my school is in. I often end up walking home, and it's almost a completely different journey, as all the breakfast stalls are away, but the dinner stalls are out serving different dishes like hot pot, braised duck legs, and more noodles. The roast shops are open, too, for commuters to pick up carved barbecue duck or pork belly, or cold dishes like cilantro salad and stuffed lotus root for their dinners at home. One of my favorite things about China is the smell of steamed baozi in the air. Great article! I recognize a lot of the items you mentioned from my time in China a few years ago. I visited a friend of mine who was teaching English in Wuhan and he took me to what he termed "Breakfast Street" - the full panoply of breakfast-specific street foods crammed into one block, open only for breakfast. I ate as much as I could, (including those spicy peanut noodles and a greasy omelet-fried rice-scallion hybrid) but sadly there was no way I could get to them all. As I recall, we were also in a rush so we could be in time for his first class of the day! I hope we hear more from Suzhou! I must say on a cold morning, there is no finer smell. I also like the wafts of cha shao smoke coming at me from the roast meat vendors. Thanks. Our street stays open all day, since it's next to the market. The dishes evolve throughout the day, though, so lunch is more about noodles - fried with your choice of bits from a buffet of options, or in soup. I lived in Suzhou for about a year before moving on to Guilin in the south. Great city to eat (and live) in, especially if you learn to appreciate the subtler flavors of the Jiangsu/Zhejiang region, maligned as they are by most Chinese. But please, please, please, sacrifice an hour of sleep on at least one day of the week to get out there and try what the city has to offer. Suzhou, more than any other Chinese city I've spent time in, is best viewed in the early hours of the day. Sure, the baozi there are particularly good, but the Xiao Long Bao (soup dumplings) restaurants are numerous, distinct and almost all fantastic. Go to the corner of Jing De Lu (景德路)and Xue Shi Jie (学士街) and look north across the intersection. There on the right side of the street (what should be the northern continuation of Xue Shi Jie but has now become Wu Qu Fang 吴趋坊) is one of the best places in the whole damn city for xiao long bao and wonton soup. From that intersection you could also continue west on Jing De Lu, cross the bridge, turn left at the first intersection and immediately stop. On your right will be a small Sheng Jian Baozi (soupy baozi that are seared crisp on the bottom and sprinkled with sesame and scallions) place that is and always will be my 1st stop for breakfast when in town. If the weekday mornings are just too much, at least plan to hit up one of Suzhou's tea houses, and plan to spend 4-5 hours. You'll be treated to everything from the finest, local Biluochun tea to homemade strawberry ice cream, chicken wings on a skewer or boiled peanuts (served randomly and usually all included in the price of the tea). And most of all, keep up the vivid posts. You have a real skill for capturing the sensory overload that is the daily hustle and bustle of a typical Suzhou morning (thankfully,minus the bike horns). The screeching brakes is what gets to me! Thanks for your in-depth recommendations. I'm quite excited about hunting these places down, and I have put pins into my own map at those locations. I will report back in the Suzhou Dining topic. There are some xiaolongbao/wonton soup places in my neighborhood, but I find their skins are too thick for my liking. Sheng jian baozi are my guilty crack addiction. They've got to be super unhealthy, right? With the fried bottom and the hot greasy pork broth inside? Whenever I indulge, I get several bags and spread them around the staff room to assuage my guilt. Cheers, I'm happy to share. With Suzhou's incredible growth I just hope those places are still there. My wife and I were discussing the quantifier used when ordering Sheng Jian Bao in some Suzhou shops. Just like some places will give you dumplings by the "liang" (两, and is usually about 6 or 7), sheng jian bao, last time I was there, were being served in batches with some bizarre quantifier. Do you know what it is? I hope they're still there, too. I'm going to try to check them out this weekend. I don't know what the sheng jian bao counter is, and a brief survey of the office turned up no greater clarity. I'll see if I can catch it while I'm out. If they put sugar on these there would be no way I could resist them. 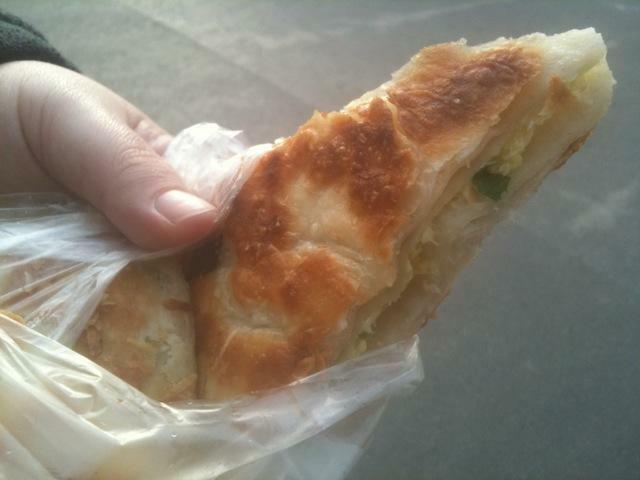 I had the ji dan bing with a cup of coffee - perfect hot dough fried in peanut oil, layered with spring onion omelet. Eggy goodness. 4 kuai for about 300g. Sure beats an Egg McMuffin! I finally got round last weekend to getting to your recommended xiaolongbao spot at Jing De lu, Luckysticks. It's the first time I'd been in that corner of Suzhou, and I'm continually surprised how the down town seems to stretch on forever following the canals. We tried to order two baskets of xiaolongbao, but the noodle mistress basically said, "One is enough, are you crazy? ", considering we'd also ordered a bowl of beef noodles and a few pickled mustard green baozi. What can I say, we were hungry. But yeah, I'm used to a smallish portion of xiaolong bao in a basket - usually three or four; this places gives eight, so that must be a liang? I realized there is a place very similar to this near my school where they specialize in "Wuxi xiaolongbao" and Sheng Jian Bao; I had a basket of the former at lunch on Friday, where they came in the more common portion of four to a basket; I feel like they were an eensy bit better with the wrappers; this may have been due to the fact that I got to the place on Jing De at 1:30 pm after the rush, whereas I was at the place next to my school sharpish at 11.30. Freshness is everything, I think, in a dumpling. I'd never really paid attention to the quantity of xiaolongbao places in Suzhou, but you're right - they're everywhere. As for the strange counter, could it be 棵? Sorry, I'm not sure of the character. My Chinese teacher said "ke" was a very Jiangsu/Shanghai way to order dumplings, but I have no independent back-up of this. Thanks, Priscilla. A beef noodle shop has opened up next door to the Cold Drink Fridge, and options have gotten even more diverse and delicious in the 'hood. Very cool ride and breakfast synopsis! Great fun... thanks for the awesome read. I was introduced to you tiao in Taiwan, my favorite being with it inside a flat bread with a scrambled egg and hot sauce. Is that a option in China or a Taiwan invention? I'm a nearish neighbour in Hangzhou. I read your hectic breakfast journey to school and was immediately overwhelmed (sensorily speaking) by your descriptions. I've only been in Hangzhou for 6 months and have tried some of the local specialities. I was wondering if you had tried any of the fish specialties of Suzhou yet? I heard about a squirrel looking fish dish (sorry I don't remember the name) and a dish using Japanese Eel called something like "Cracking eel paste". Can you enlighten us?